Perfect world: You have a content strategist on staff who turns out tons of amazing, fleshed out content ideas/concepts at the drop of a hat – no matter the topic or client. Real world: Your content strategist is either overloaded, out of ideas (brainstorm burnout anyone? ), or doesn’t exist. And, who knows anything about textile manufacturing anyway? Enter: Pitching from ClearVoice (in beta) for brands and agencies. Whether you want to challenge your in-house team, need a subject matter expert, or want to hire a freelancer; Pitching makes it easy to get new ideas for content directly in the ClearVoice platform. Invite freelancers from our talent network and in-house writers to pitch content ideas directly to you. Set tentative budgets and timelines. Easily filter and organize requests and submitted pitches. Communicate with writers and freelancers about their pitches in-app. Turn ideas you like directly into assignments or save them for later. Request pitches as often as you want. Pitching is currently being offered in beta to all ClearVoice customers. If you’re a current customer, we’d love your feedback. Login to access Pitching via your dashboard and visit the ClearVoice Ideas Portal to let us know about your experience. If you’re not a ClearVoice customer, contact our sales team to get started. Request pitches from your own writers or from the ClearVoice Talent Network. It all starts with a pitch request, where brands and agencies can let writers know what they are looking for. What’s the topic? Budget? Target audience and keywords? Most fields are optional, allowing you to be as specific as you’d like. There is no limit to how many pitch requests you can create. Pitch requests can be sent to internal team members, or ClearVoice freelancers you’ve worked with previously. Easily request and track pitches on your schedule. When a user submits a pitch, the requester will immediately be notified. Pitches are collected under the initial pitch request. Need pitches for a future campaign? No problem. Simply schedule the submission period accordingly. Close pitch requests whenever you’d like, or keep them open as long as you want. Communicate with freelancers about their pitch via in-app messaging. Take what you like, leave what you don’t. 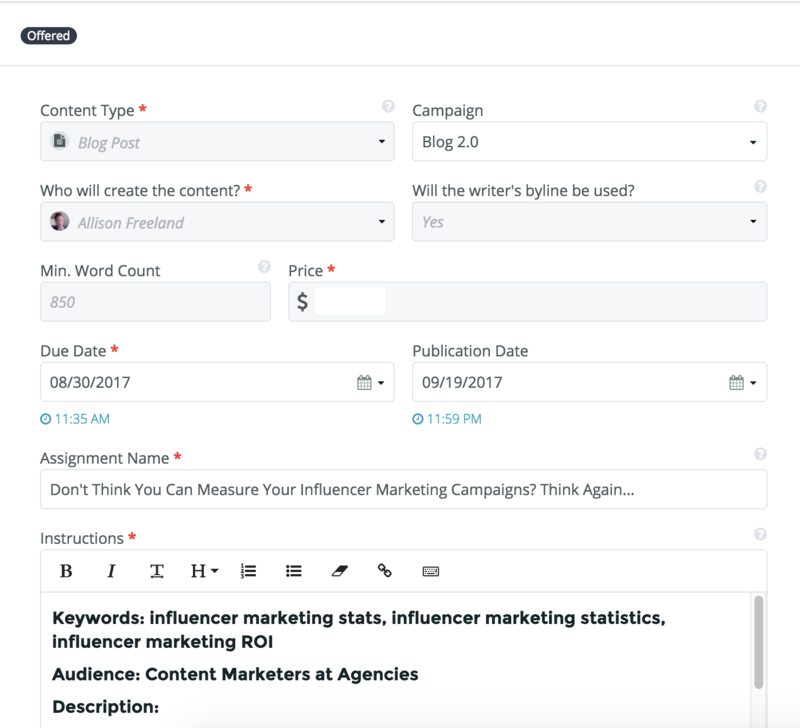 Turn your favorite pitches directly into assignments. Easily accept or decline pitches, providing feedback for the writer. Turn the pitches you like into assignments, maintaining all the details you set, including pay, campaign, etc. If you’re already a ClearVoice customer, log in to ClearVoice and access Pitching (in beta) via your dashboard. If you’re not a ClearVoice customer, contact our sales team. Are you a current ClearVoice user? Let us know what you think about pitching (in beta) in the ClearVoice Idea Portal.